Our records show that you've completed an application for on-campus housing at K-State. The next step in this process is to complete the contract in the Resident Portal, which you will be able to do starting Thursday, Nov. 1, at 9 a.m. (CST). We take you through the contract completion process in this demo video. Contract pages may load slowly on Nov. 1 due to high traffic. Please be patient and click each button only once. Here are a few "Good to Knows" for completing the contract. 1) Your contract will be available in the Resident Portal. 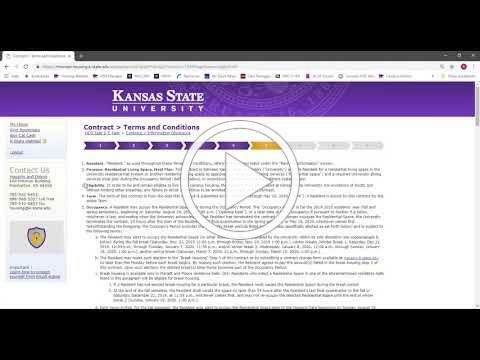 You will sign your contract online through your K-State Housing and Dining Services Resident Portal. This will require your K-State eID and password. We recommend you try logging into the Resident Portal prior to Nov. 1 to make sure you know your eID and have the correct password. If you are having trouble with your eID or password, contact the University IT Help Desk (iTAC) at 785-532-7722, helpdesk@k-state.edu or use their online help resources. Housing and Dining Services staff do not have the authority to change passwords. For increased expediency when completing the contract, please use a laptop or desktop computer instead of a mobile device. 2) Your contract is not complete until a payment is made. A $400 payment will be required to complete the contract. The payment can be made online with credit card or with check or cash at the Housing and Dining Services Office in the Pittman Building. The entire contract down payment is refundable until June 1, 2019. A $200 cancellation fee will apply after that day. Please contact our office if you have any questions or concerns regarding the contract down payment. 3) Future edits on your contract will not change your submitted date. The date you complete your contract will be your submitted date and will determine your place in line for room selection. If you are not 100 percent certain who your roommates will be, what meal plan you want or even what CAT Community you are interested in, you have the option to return to your Resident Portal and change those selections on your contract. Any edits you make to your contract after completion will not change the submitted date or your place in line. July 1, 2019, is the last date to make any changes in your Resident Portal. 4) Completing the contract is not the final step. Students will be able to select a residence hall space in the spring of 2019. Returning residents may reserve a space via the Choose Your Experience process in January and February. Students in CAT Communities have the opportunity to select in April while all other new students select their room in May. Because you have the opportunity to select your specific room in room selection, you will not be asked for any room or hall preferences on the contract. If you have any questions or concerns about the contract or the contract process, please do not hesitate to contact us at housing@k-state.edu or at 785-532-6453.